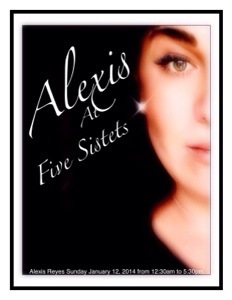 Alexis Reyes, a well known Psychic in the Miami area, will be doing a Special guest appearance at Five Sisters on January 12,2014 from 1:00pm to 5:00pm Alexis’ is best known for her appearances and beautiful readings at Veronica’s Dollhouse. It’s no longer rumored that she will be a Special guest at Five Sister. Now you can see her for yourself on January 12, 2014 and see this beautiful well known, and respected Psychic do her magical readings, that she is so well known for. To see “Alexis Reyes” at Five Sisters. You will need to make an appointment, prior to coming. But walk-in are welcome.